I wanted to share a bit more information about roadrunners with you. One thing Elaine didn’t include in the book is the sound that roadrunners make. So I offered to talk about it. She didn’t mind. You probably know the “meep-meep” from the cartoon version of the roadrunner, but this is not how they sound. Roadies actually make a variety of sounds. Males make a coo-coo-cooing call to communicate territory situation to other males. There are single note coos, low pitched growls and short, snap barks. Quite the repertoire. 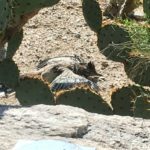 This roadrunner is exposing his dark skin patch to the sun to warm up on a cool morning. The roadrunner’s dark skin patch is mentioned in her book. Elaine saw a roadie warming himself and was able to photograph him. One thing I’m curious about are the roadrunners’ salt glands. Most of us get rid of our extra salt through urinating after the kidneys concentrate it. But that method requires a lot of water. When roadrunners need to get rid of extra salt, the use a gland in front of each eye. This a water saving mechanism. This reminds me of the way iguanas sneeze out their excess salt. It’s nice when reptiles and birds have similarities, don’t you think? Humans seem to think roadrunners are great to have around; we lizards have a different opinion. Roadrunners eat a lot of lizards! Our advice to the roadies, is eat more snakes. This entry was posted in Uncategorized on October 29, 2017 by Elaine.